I am getting ready to launch a new service. We will offer employee manuals and policies for businesses. Employees will then have to register with us (for free) and agree to the terms in the employee manual and the employer policies. In addition, employees that have a grievance agree that they will file the grievance against the employer using our Grievance procedure and agree to our Rules for Workplace Disputes. A Notice that the employee is either Compliant or Non-Compliant with Employer requirements (for example, signing off that the employee read and agrees to the Employee Handbook, etc.). A place for Alerts relating to a pending Grievance. I don't have a specific preconceived notion of what this must look like, including the order or arrangement of the above items (there may be additional features that you think such a dashboard should have that I didn't mention). I just want something fresh and appealing. 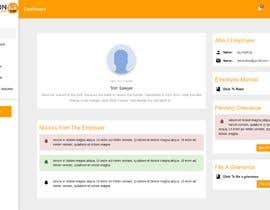 It is very important that the dashboard be very user-friendly because there will be individuals who will have to use this who are not familiar with using computers. Feel free to ask questions. Again, at this point, I just want a mock-up (i.e., no functionality needed) of what the ideal dashboard would look like given the information provided above. So far, none of the entries have been of any use. It is clear from most that the entry had nothing to do with my project. For those that do this, I interpret it as if you can't follow directions and I can't work with you. Greetings! Can you please rate entries so we are sure if we heading towards right approach or we should change the designs? Your rating will help us to pursue something better on same lines or change the act all together. Can you please review #21 . Have a great day and successful contest. Hello Contest Holder, can I submit my unfinished design? Working and I am sure that I can do my best. Please don't close the contest earlier. 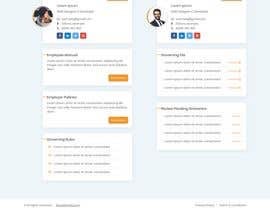 For this contest, I want an employee dashboard design which will be a little different from the employer dashboard. I tried to be very detailed in my description to give as much clarity as possible but do not hesitate to ask any questions.